ASIS Swiss Chapter - Women in Security / 2019 WIS Event / Save the date! 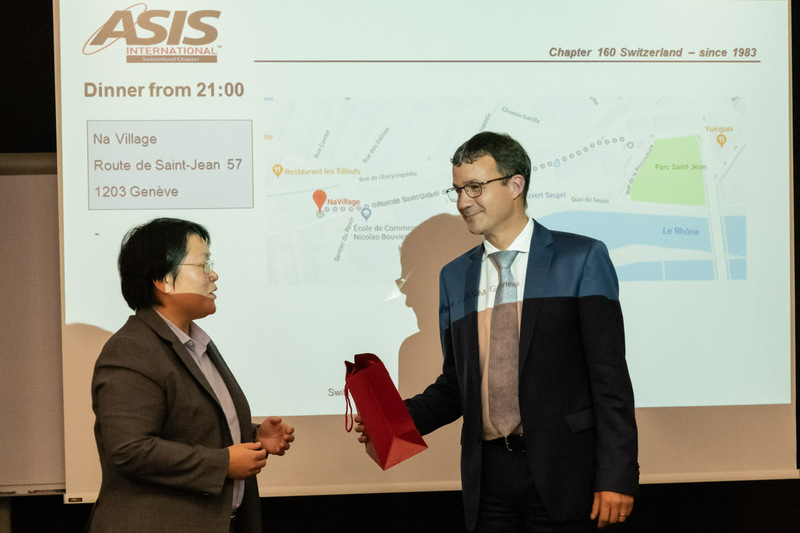 For the third year, ASIS Switzerland Chapter has presented its Young Professional Award. This year's winner is Salomé Chatagny. The award was presented during the event about Artificial Intelligence organised by the Chapter on 15 November. During the General Assembly, Pierre Kupferschmid presented for the last time as co-chair the achievement of the Chapter. Pierre stepped down in this function but will assume the responsibility of vice-chair for the Western region of Switzerland. Nicolas Stramilos, CPP also resigned from his function as Treasurer. Both Pierre and Nicolas were applauded by the members and received a gift in recognition of their volunteering. Two new board members were also elected (Barbara Caspar and Laurent Constant) to assume the responsibility respectively of secretary and treasurer, while Aurore Chatard will chair the chapter. Details of the new Board composition is available on our website at ASISOnline.ch. Aurore Chatard presenting gifts to Pierre Kupferschmid and Nicolas Stramilos in recognition of their volunteering. 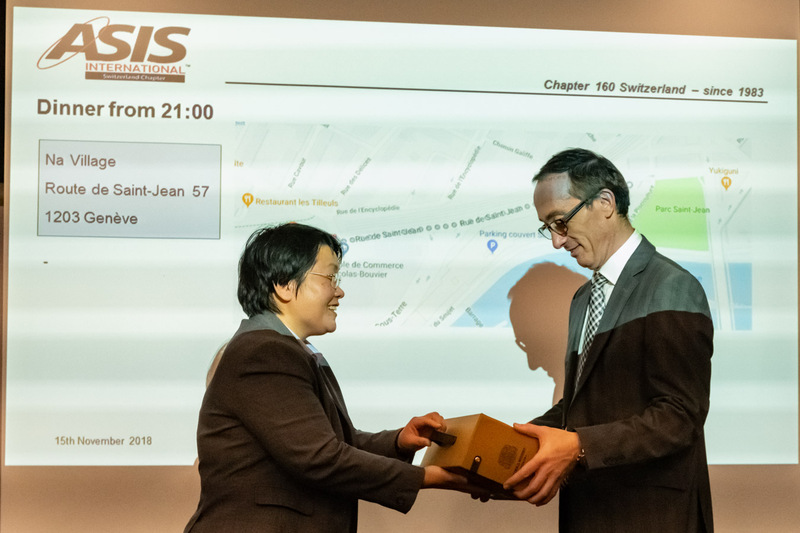 The recent months were busy for the Swiss Chapter of ASIS International. Not only did its Annual General Meeting take place on 15 November (see this news), but during the same afternoon a large event with more than 200 people in attendance was organised by your Chapter (as main sponsor) and several other associations to listen to views from specialists and debates on Artificial Intelligence (photographs available at https://www.fer-ge.ch/web/fer-ge/conference-15-novembre-2018). Artificial Intelligence (AI) will impact all aspects of our societies, including the security industry. According to one of the speakers, the question is not whether it will happen; it is actually already there for example in the job candidate screening industry or in e-commerce (with sometimes unexpected outcomes). As security experts, we should understand this developing technology and its potential and limits. Interestingly, the human side of AI was largely featured throughout the presentations, one speaker for example explaining that we should be nice to robots if we expect them to be nice with us, while another added that AI will eventually reflect our own humanity. 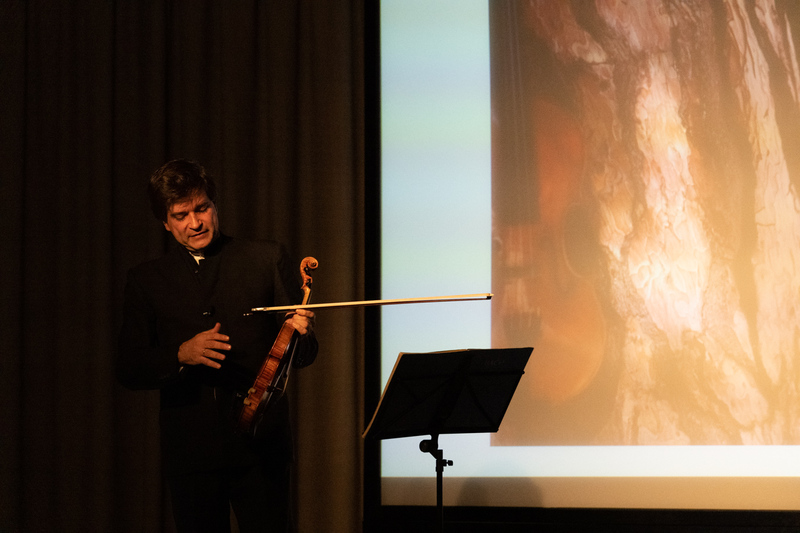 This was brilliantly illustrated by the keynote speaker, virtuoso violinist Fabrizio von Arx, who compared his playing of a Johann Sebastian Bach composition with the musical work "Genesis" created by AIVA, the Artificial Intelligence Music Composer. While musically correct, this work did not yet provide the subtlety, depth and details of its 250 years old counterpart. It will be interesting to witness how fast and well such systems will evolve! Virtuoso violonist Fabrizio von Arx explaining his views on music composed by Artificial Intelligence.